Season Pass is for the ultimate Metro fan. 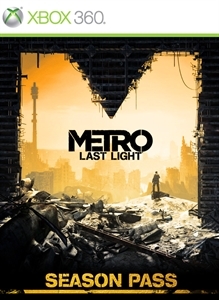 It is a discounted pre-payment for future Metro downloadable content. With its purchase you will receive The Faction Pack, The Tower Pack, The Developer Pack, and The Chronicles Pack. It also includes an instant redeemable weapon: The ABZATS. All content featured in the Season Pack will be available for individual purchase on Xbox LIVE Marketplace. Do not download this content from Xbox LIVE Marketplace to avoid being charged twice.